DAIMLER Recruitment 2019. Recruitment will be held on 15-02-2019 through walk in interview. Selected candidates will be trained for 18 Months. Interested candidates may attend the walk in interview along ID and address proof and other required documents. For more details you can check the official website of www.Giridih.nic.in. Detailed information about this DAIMLER ITI Apprentices recruitment is updated below. 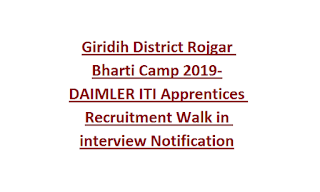 There are total 200 ITI Apprenticeship vacancies in this DAIMLER recruitment 2019. Candidates must be within the age limit of 18-25 years. 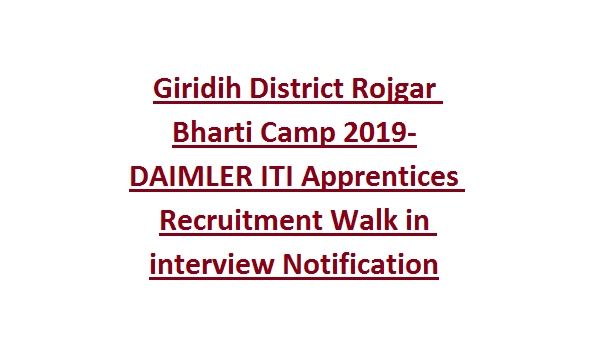 Only ITI qualified candidates are eligible to apply for this Giridih District Rojgar bharti. Candidates selection is based on personal interview and based on their ITI marks merit. Candidates can attend the walk in interview on 15-02-2019. Must have produce all required documents along with ID and Address proof.